Hundreds stood in vigil for the release of three American hikers detained in Iran. The morning after she held a vigil for her daughter to mark 100 days of captivity, a Berkeley mother heard discouraging news from the Iranian government. A senior Iranian prosecutor accused three Americans detained on the border with Iraq, including Sarah Shourd, of espionage. That is considered an early signal that Tehran intends to put all three on trial. 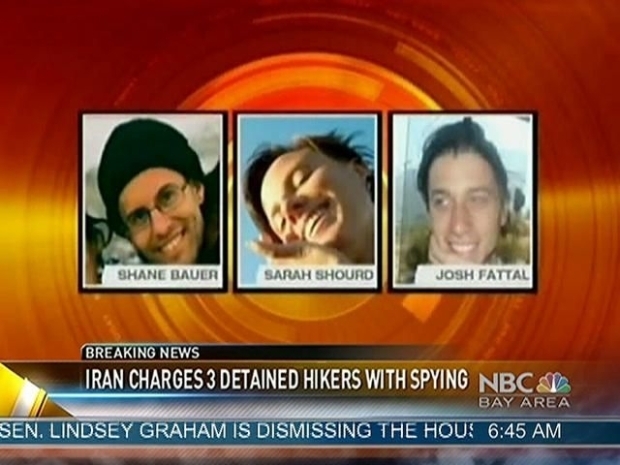 Shourd, Shane Bauer and Josh Fattal, all Cal graduates, were arrested July 31 after straying over the Iranian border from northern Iraq. The U.S. government and their families say there were on a hiking vacation and crossed accidentally. Sunday marked 100 days since their arrest and vigils were held across the country. Then overnight Tehran chief prosecutor Abbas Jafari Dowlatabadi announced the three "have been accused of espionage" and that investigations were continuing, according to the state news agency IRNA. He said an "opinion (on their case) will be given in the not distant future." A senior Iranian prosecutor accused three Americans detained on the border with Iraq of espionage on Monday, the first signal that Tehran intends to put them on trial. It is not clear from his comments whether formal charges had been made, but such announcements are often a sign that charges are imminent if not already filed. In Iran's opaque judicial system, the process of indictment and trial often takes place behind closed doors. The timing of the announcement raised the possibility that Iran was using the case to pressure the United States amid the negotiations over its nuclear program. It came as Washington and Tehran are maneuvering over a deadlock in negotiations over Iran's nuclear program. "We believe strongly that there is no evidence to support any charge whatsoever," Clinton told reporters in Berlin. "And we would renew our request on behalf of these three young people and their families that the Iranian government exercise compassion and release them, so they can return home." Clinton said the U.S. would continue to make that case through the Swiss channels who represent U.S. interests in Tehran. Shourd's mother met with the Secretary of State last week in what Shourd describes as an emotional meeting. Clinton met with the mothers of all three hikers. "We talked a lot like mother to mother with her which felt very good to all of us mothers. It's important for us for people to understand how important our children are to us," Nora Shourd said. She said Secretary Clinton assured them that the U.S. government is doing everything it can to secure the hikers' release on humanitarian grounds. The United States and Iran don't have diplomatic relations, so a Swiss diplomat is the only person allowed to visit the three. So far there have been two visits and the three were described as in good physical condition. "Psychologically this must be very hard for them and we just hope that the Iranian officials will find an opportune moment to let them go," Shourd said.